Cells from a living healthy baby’s umbilical cord could change this, providing the proteins, stem cells and growth factors needed to promote cell renewal and healing. The treatment is a simple non-surgical injection into the affected joint with no down time or lengthy recovery. 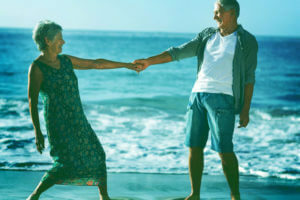 You may maintain your normal lifestyle and allow the cells to create a balanced optimal environment in your joints so your body can repair itself. You should feel maximal results within 3-9 months at which time you can increase your activity levels to match your comfort, but understand that the regenerative process can continue for long periods of time. The newest advancements in Umbilical Stem Cell therapy are directed towards creating a healthy environment in your joint while stimulating your body to assist in the regenerative process, whereas; medicine of the past used drugs to merely mask the symptoms. Umbilical cord cells include stem cells, growth factors and a range of other beneficial proteins and compounds. We only use umbilical cord blood which has been purified to get rid of any harmful substances that might cause rejection of the treatment by your body. We inject the treated cord blood into the affected area, where the various active compounds found in cord cells go to work immediately to begin inflammation reduction and the promotion of healthy cell division and renewal. Some of the active compounds at work include VEGF (Vascular Endothelial Growth Factor), IL-LRA (Interleukin-1, a receptor antagonist, stem cell factors (SCF), FGF-2 (Fibroblast Growth Factor-2) and Transforming Growth Factor-beta (TGF-beta). Each of these compounds has a slightly different effect, but the net result is that the damaged cells in your joints are given the ingredients they need to kick-start healthy renewal and regeneration. The injection creates a healthier environment that encourages positive, healing changes to take place. A better blood and oxygen supply to the area, a reduction in damaging chronic inflammation and stimulation of healthy tissue growth are all typical consequences of the minimally invasive stem cell treatments we provide. By using umbilical cord cells in this way, it’s possible to transform joint therapy into a holistic healing process that prompts the body to enhance its own regenerative efforts. This results in a natural process of joint health improvement in the weeks or months following the injection. 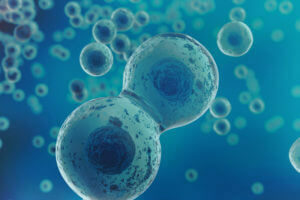 The cells introduced to your body through the injection begin to work as soon as they enter the joint area. They change the complex balance of chemical reactions taking place in the area, causing inflammation to slow and regeneration to speed up. Your body already knows what to do to heal itself; our treatment just nudges it to accelerate the process. 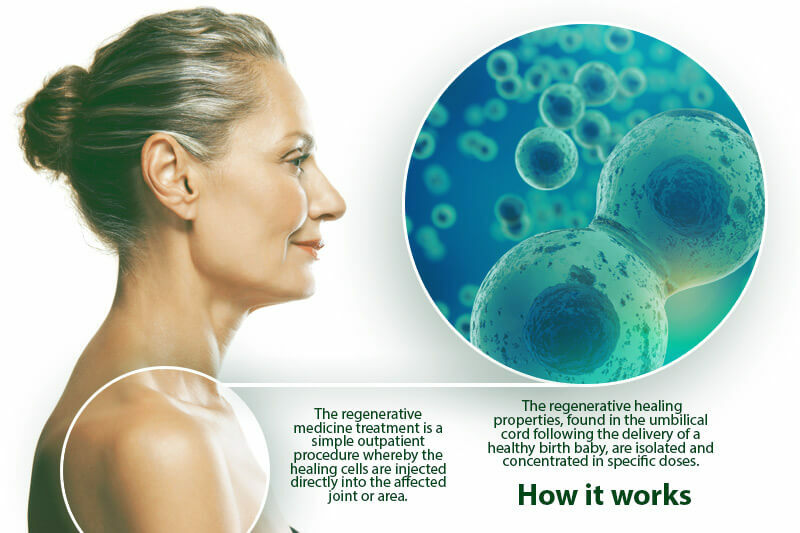 Some of the cells that form part of the treatment help your stem cells to respond to your joint trauma resulting in healthier support to the other important tissues surrounding your degenerated joint creating greater healing.